It's October already and the holiday season is fast approaching! I am always on the lookout for gift ideas, and I think I might have discovered a really good one. It's the BOOK LOVERS 2011 CALENDAR. 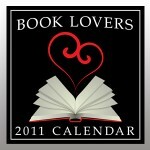 The Book Lovers 2011 Calendar is perfect for the "book lover" in your life. (In my case, that person is me!) The calendar is perfect for hanging (mine will go next to my desk) and features many colorful book related photos. There are pictures of book stores, books (of course), and even a restaurant with a book theme. I was actually surprised by the variety of pictures and I can tell that I'm going to look forward to turning the page each month. In addition to the gorgeous photographs, there are other thing about this calendar that make it extra-special for readers. For example, each date on the calendar notes an author who was born on that date and lists one of their works. There are also wonderful quotes from books and authors as well as a feature story each month on book-related locations, events, etc. This calendar will definitely strike a chord with book lovers everywhere. However, there is one more thing about the Book Lovers 2011 Calendar which really makes it stand out. A portion of the sale of these calendars goes to FirstBook.org. For those of you who aren't familiar with this fantastic organization, First Book's mission is to get new books in the hands of children. Make sure you check out Book Lovers Stuff to learn more about this calendar as well as to see lots of other great book lover gift ideas! Thanks to Mary Bonelli for sending me a sample of this calendar. I love the fact that it features author's birthdays. What a fun calendar! Of course I want to know what famous author has the same birthday as me! This is a great idea. Between this and Stephanie's books yesterday, I've got people covered already! Julie thanks for bringing this to my attention. I will have to order one. What a great idea. Oh wow this looks awesome!! Fantastic idea. I'd really like to have one. Thanks for the giveaway and the chance to win this 2011 calendar. I hope I win it!